Catherine must be prepared for the torture by the Pear of Anguish. First her body stretched tightly on the torture rack. She screams... now she is ready. 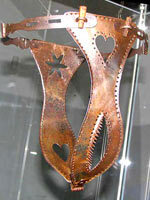 This witch suffers the worst interrogation in the Inquisitions dungeon - the Pear of Anguish, the vaginal pear - an iron torture instrument shaped like a pear! Used during Medieval Times, the Pear of Anguish was an extremely painful device used to torture of witches - This pics are from Inquisition World website, so you can find them in hi resolution there. Welcome to the world of Inquisition!